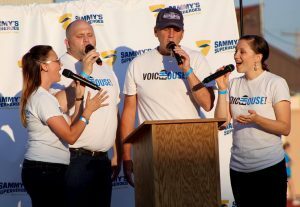 VoiceHouse was honored to sing our new rendition of “For Good” at the Sammy Super Hero Glow Gold event last night at Pawnee Park. It was amazing to see the support given to all of the families that have been devastated by cancer in their families…especially the young ones. God bless all the organizers and the families involved last night. We hope our music helped encourage you in some way. ← VoiceHouse at Columbus Lawn Chairs on the Square!